This Alkaline Water Filter Pitcher will produce a moderate pH and moderate negative Oxidation Reduction Potential (-ORP) levels. A negative ORP level means the water works as an antioxidant. Regular water has a positive ORP, which means it is an oxidant which could create damaged free radicals in your body! Simply fill the reservoir with cool tap water, and it will filter out chlorine and other contaminants and permanently absorbs metals such as lead and copper. The drinking water will be more refreshing and clear that’s ideal for drinking, cooking and brewing coffee or tea. The 3.5L capacity pitcher comes with one filter cartridge and fits conveniently in the refrigerator door. The Easy opening fill lid - You don't need to take out the cover to fill-in the water. Just need to press the lid slightly and fill-in the water. The "Smart" digital indicator lets you know when it's time to replace the filter. Perfect for home or college. Lid and handle material: Acrylonitrile Butadiene Styrene (ABS) (recyclable and has the number "9" as its resin identification code). Cartridge housing material: Polypropylene (PP) (recyclable and has the number "5" as its resin identification code). Inside material: Active carbon, Ion exchange resin, Alkaline Oxidation Reduction Potential ball (ORP Balls), Magnesium Ball. Package box made with recycled paper. Gross weight: 980 g (2.16 lbs) . Create silky-smooth and great tasting water that is refreshing to drink and cook with. Helps filter out chlorine and other contaminants and permanently absorbs metals such as lead and copper. The drinking water will be more refreshing and clear. Reduces limescale, prolong the domestic appliance life by preventing limescale. Offers pH 8.5-10 to help support systemic pH balance in the body. Provides low negative ORP: -100mv to -300mv. This transforms ordinary water into rich antioxidant water to help energize and revitalize your body. Reduces water molecule size to create more absorbable water and increase hydration. Increases the alkalinity to make your drinking water more vital. "Smart" digital indicator will remind you to replace the cartridge in time based on the drinking people number. Humanity design makes convenience usage. * The Easy opening fill lid - You don't need to take out the cover to fill-in the water. Just need to press the lid slightly and fill-in the water. * Easy pour-out - It has an active pour out lid, make you pour out the water easily. * Smooth grip handle make your hand feel very comfortable. * Easily replaceable cartridge, replacement just only by gently screwing. Fashion design to fit inside refrigerator door to save your space. The activated carbon filter which has a slight electro-positive charge, making it attractive to chemicals and impurities. As the water passes over the positively charged carbon surface, the negative ions of the contaminants are drawn to the surface of the carbon granules. Carbon filters require very little maintenance, and are perhaps the most powerful chemical absorbents known to man. This carbon-based filter removes organic contaminants from regular municipal tap water and meets or exceeds NSF International Standard 42 for chlorine, taste and odor reduction. An organic compound that will adsorb ions under some conditions and release them under others. The best-known example is in water-softening, where calcium ions are removed from the water by binding to the resin, displacing sodium ions. The resin is then regenerated by washing with a concentrated solution of salt, when the sodium ions displace the calcium ions. Ion-exchange resins are used for purification of chemicals, metal recovery, and a variety of analytical techniques. Oxidation-reduction potential, or ORP, is a measurement that indicates the degree to which a substance is capable of oxidizing or reducing another substance. ORP is measured in millivolts (mv) using an ORP meter. A positive ORP reading indicates that a substance is an oxidizing agent. The higher the reading, the more oxidizing it is. As such, a substance with an ORP reading of +400 mv is 4 times more oxidizing than a substance with an ORP reading of +100 mv. A negative ORP reading indicates that a substance is a reducing agent. The lower the reading, the more anti-oxidizing it is. A substance with an ORP reading of -400 mv is 4 times more anti-oxidizing than a substance with an ORP reading of -100 mv. Most types of water, including tap water and bottled water, are oxidizing agents as their ORP value is positive. Our normal tap water a positive ORP of around +500 mVolts. This means that every time we drink tap water it takes electrons from our body. The water is "dead" and actually steals electrical energy from us. After filtering the water through the Alkaline Water Filter Pitcher the ORP was a negative -484 mV and consequently is a donor of electrons to the body. In human biology, magnesium is the eleventh most abundant element by mass in the human body; its ions are essential to all living cells, where they play a major role in manipulating important biological polyphosphate compounds like ATP, DNA, and RNA. Hundreds of enzymes thus require magnesium ions to function. Magnesium compounds are used medicinally as common laxatives, antacids (e.g., milk of magnesia), and in a number of situations where stabilization of abnormal nerve excitation and blood vessel spasm is required (e.g., to treat eclampsia). Magnesium ions are sour to the taste, and in low concentrations they help to impart a natural tartness to fresh mineral waters..
Do not expose to direct sunlight and keep it away from the heating elements. Please replace the cartridge on time to ensure the filtering quality when the indicator light reminds. The lid with indicator must not be washed in the dishwasher. Please clean the lid by hand wash only. DO NOT wash the filter cartridge. When cleaning the water filter pitcher. DO NOT use this water filter pitcher where water is microbiologically unsafe or of unknown quality. DO NOT use this water filter pitcher with carbonated drinks, milk, coffee, tea, hot or boiling water. To ensure optimum performance, please change the cartridge every 4-6 weeks or 300 liters of regular daily use. Every year, bottled water produces about 1.5 million tons of plastic waste. It's estimated that a mere 20 percent of these plastic water bottles actually make it to a recycling bin. The rest end up in landfills where they will take 450 to 1,000 years to decompose or in the ocean where marine life often fatally mistake the bottles for food. 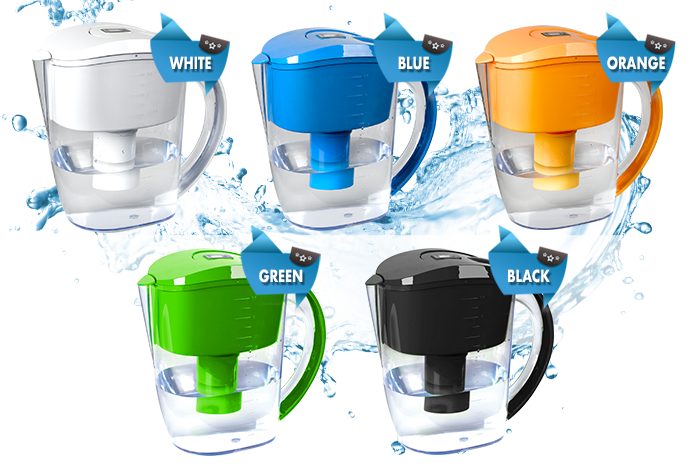 One water filter pitcher replaces about 300 standard 500ml bottles water. 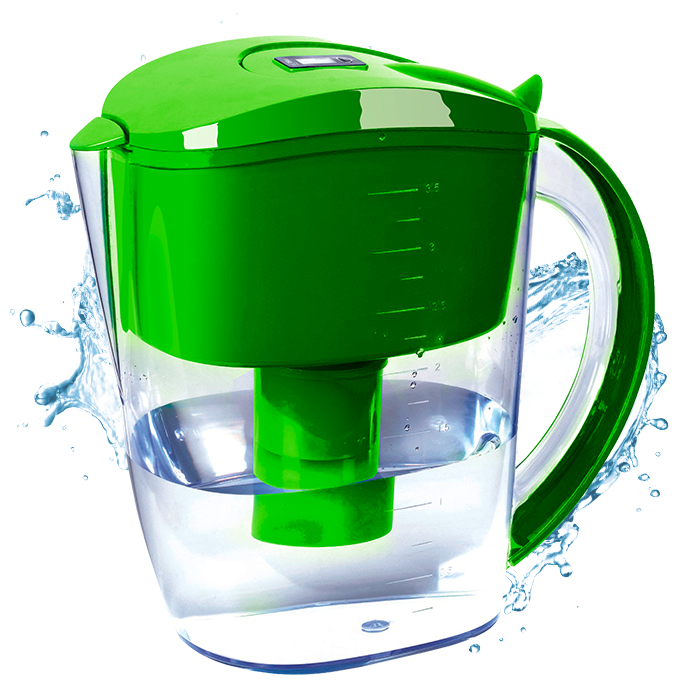 By using this water filter pitcher, you help reduce plastic waste and landfills that could pollute the environment. Not only that: it also eliminates the need to boil water which saves valuable resources and reduces greenhouse gas emissions. To offer our customers with the best quality products, we have team up with our partners to produced our own house-brand. To raise consumer awareness of the facts surrounding sourcing issues, we work with our partners carefully, label our products honestly and make information easy to find in our online store. Like our customer, we care about where our products come from and the origins of the raw materials. We have tested and use the product before we agreed to let our partner produced in production line. To minimise the impact on the enviromental, we insists only using recyclable paper for our product packaging. And, instead of the usual colorful packaging printing, we only use minimal color (1 color) for the packaging printing. By producing own house-brand, not only do we bring our customer good quality and also at competitive price product. That is our mission!